Uni is a wonderfully confusing time. Between running on fifty-percent espresso and fifty-percent UberEats, keeping up with your newfound freedom (read: washing) and*actually* having your bank account in surplus, university life is the figurative deep end. 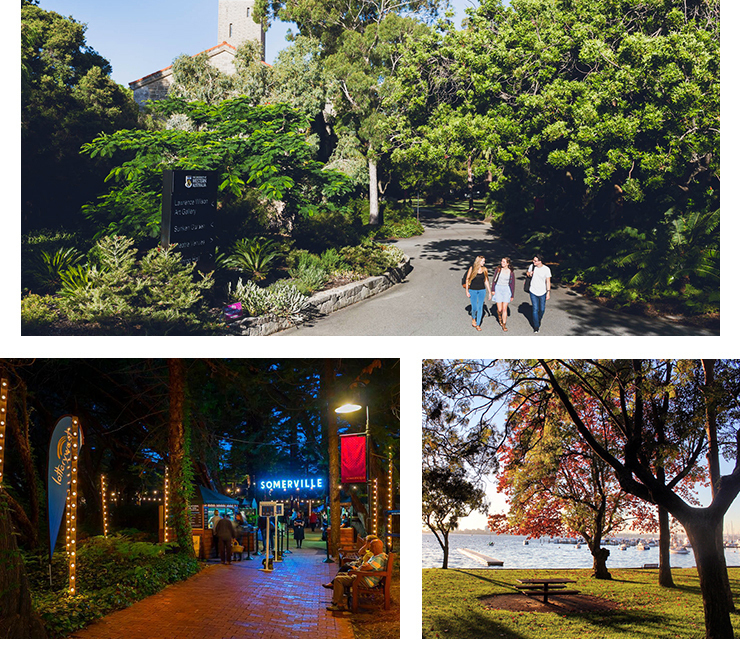 When you’re in desperate need of some well-deserved time out, your uni has your back—and not many do it better than The University of Western Australia. So, we teamed up with our mates over at UWA to uncover the things that will make your life better—whether you're looking into further study or choosing between unis. You're welcome! When you’re cramming for six exams and are knee-deep in four-hour sleep patterns, there’s nothing better than seeing a furry pupper or friendly kitten walk onto the footpath (#squeeeal). At UWA they do one better, with pet peacocks that date all the way back to 1975, when two peacocks and two peahens (that’s the female version) were donated to the university. Their offspring (and their offspring’s offspring) have been living happily and noisily at the uni ever since. Catch them if you can? We know you don’t want to hear it: but an active lifestyle can do leaps and bounds for your mental (and physical, since we need to talk about your Mi Goreng diet) health. Signing up to a gym close to uni is a great way to stay fit and healthy during your class breaks. 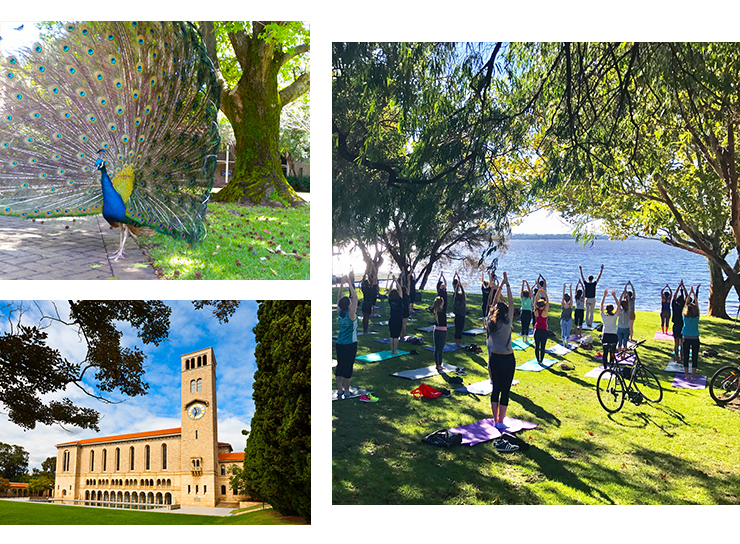 Along with the other 900 student events that run every year, weekly yoga and Pilates classes are held on the picturesque Oak Lawn at UWA. BYO yoga mat and good spirits to start the day off right. Finding a handful of fave foodie spots that fit into your (admittedly limited) budget, will make exam time infinitely easier. Who ever said no to cramming over three-cheese fettuccini? UWA has an entire food truck village, so essentially, you never have to leave campus again. The Guild, UWA’s student body, runs the on-campus foodie village every weekday. The rotating calendar of food trucks includes Georges Greek Van, The Stuffed Spud, Flying Falafels and Jumplings (hell, YES). Although you won’t see any appearances from Brad Pitt, joining a fight club will mean you finally have a healthy outlet for all that pent up assignment anger. At UWA you can put on your wraps for the Medieval Fight Club. Student clubs are a unique way to meet fellow students from all walks of life and make some new mates while you’re at it. Hey, you’ll need to find that new gym buddy anyway, right? UWA has over 146 student clubs, so good luck deciding on the handful you can actually attend! Renew and refresh your way of thinking with your university’s huge array of arts festivals on offer. A favourite in Perth’s creative scene, the Perth International Arts Festival is held at the beautiful grounds in UWA. Make a beeline for the jaw-dropping Somerville Auditorium to catch an artsy flick. Skip the manic car trips, the sweaty train rides and take your bike to university. Along with catching some fresh air, you can soak up some much-needed sunshine on the trip in. Nestled next to the Swan River, UWA looks out over the city skyline which means it’s ideal for Instagramming if your feed is looking less than sharp (and perfect for picnics in summer!). There’s nothing worse than a university that looks like a scene out of Orange Is The New Black. Aptly named the Jurassic Garden, trees in UWA’s stunning Tropical Grove are as old as dinosaurs. Proving the garden to be the perfect location for a mid-afternoon study break. The best bit? Now that you've heard all about UWA, the foods trucks and free yoga, you can get a taste at the 2017 Open Day. Editor's note: This article is proudly sponsored by The University Of Western Australia and endorsed by The Urban List. Thank you for supporting the sponsors who make The Urban List possible. Click here for more information on our editorial policy.